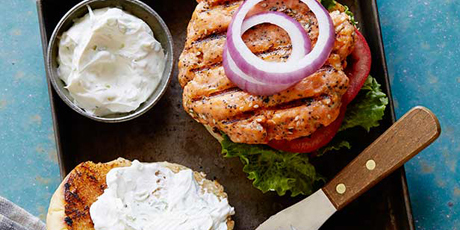 Juicy salmon burgers topped with a cream cheese sauce, tomatoes, red onion, green lettuce and served on a crusty Kaiser roll. 1. Preheat outdoor grill if using to medium high. Prepare hot grill with cooking spray. Indoors, use a large skillet rather than a grill pan and preheat with a drizzle of extra-virgin olive oil to medium-high heat. 2. Place salmon in food processor and pulse to coarse grind meat to form burgers. Transfer fish to a mixing bowl and season with grill seasoning, poppy seeds, sesame seeds, and dill. Mix and form 4 patties. Drizzle the burgers with extra-virgin olive oil. 3. Cook burgers 3 minutes on each side for a pink center, 4 to 5 minutes on each side for fully cooked fish. 4. While burgers cook, combine in a bowl the cream cheese and the scallions and fold in sour cream and lemon juice. 5. Top the burgers with lettuce, tomato, onion and sauce on crusty, toasted buns.